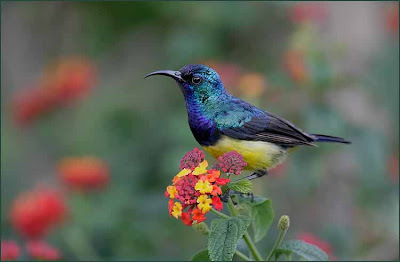 Sunbirds are small birds and look something like the humming birds. Their flight is like darts. They usually feed on nectar and some of them hover like humming birds as well. The sunbird can stay perfectly still in the air by fluttering its wings, and its hooked beak is ideal for drinking the nectar from flowers. a tiny reddish bird, usually arriving in a little group, and looking for grass seeds and the like.
. SAIJIKI FOR KENYA AND TROPICAL REGIONS . ***** . The Bird Saijiki .